I teach solo performance, duets, and help students of all ages prepare for playing in orchestra. Solo music is very important, but not the whole story. Most of us will want to play in an orchestra or other ensemble. I am unique in teaching duets right at the beginning, so ensemble elements become natural. I encourage a reasonable and comfortable practice schedule at home and then regular lessons at least once a week. 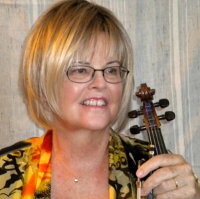 During my lengthy career as a violin teacher, I have found that the ability to monitor one-on-one, and to correct technique as the student plays is crucial to rapid learning. I have always sought a respectful and supportive relationship between teacher and student.